Front and back covers of Treasury Edition #23… Notice that the gory scene is kept for the back cover. Too brutal for the kids' section? 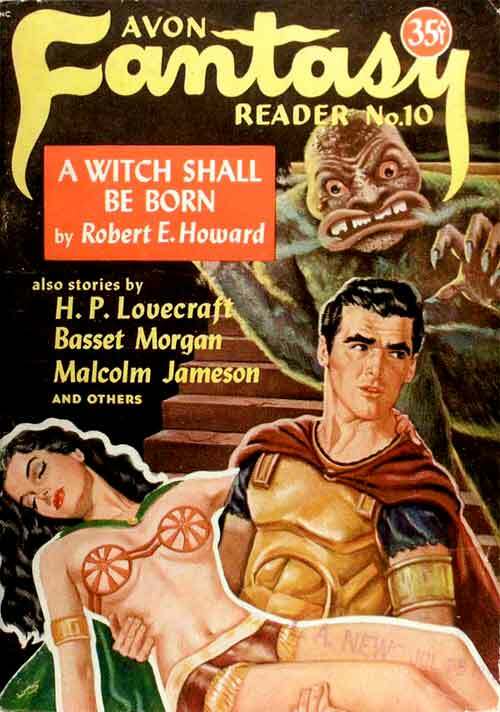 (While we're at it, here's a cover from the late 1940s... the Avon Fantasy Reader reprinted the Weird Tales story). This is an adaptation of a REH Conan story. 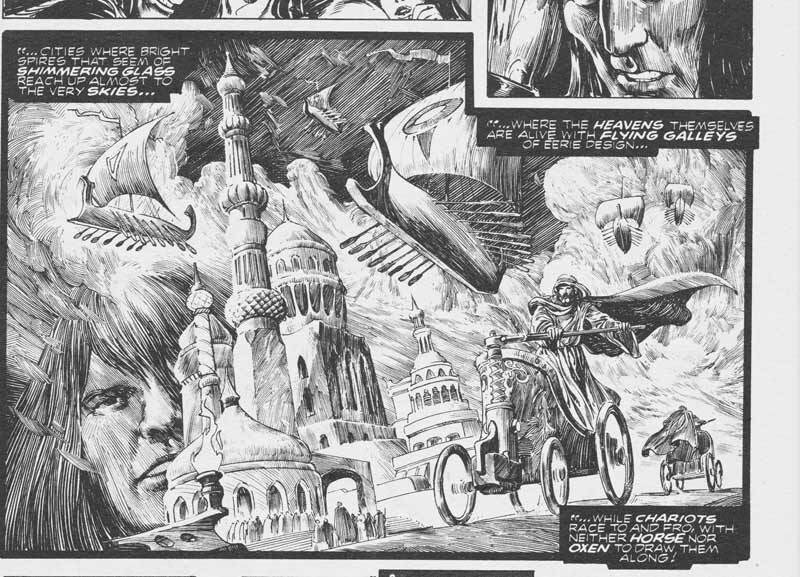 I don't think it's too much to say it's one of the major stories, even if it occurs in a small kingdom, Khauran, that we will never visit again (a bit like Khoraja from issue 2, really). It is a very brutal Conan tale, in which each major character really goes through the grinder, physically and emotionally. The Cimmerian was a pirate on the Vilayet sea for awhile, as seen in issue #4, but has now travelled west to find a different kind of employment. (Issue 38 will detail the loss of his ship; he was left for dead by his crew). The Cimmerian is now captain of the guard of Taramis, the young queen of Khauran. This prestigious position shows that at this point in his life, Conan can secure an important position without spending years climbing through the ranks of an army; I'd say it's a safe bet that he would be recognized as the same general Conan who, as chief of the neighbouring kingdom of Khoraja two or three years prior, had proved so successful against an army of desert raiders. 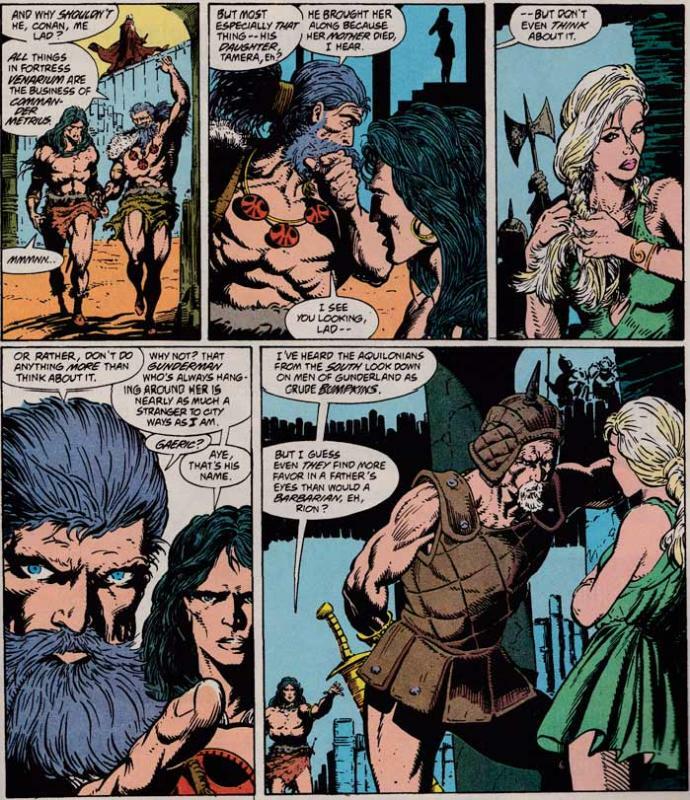 Comic-book continuity-wise, it will later be shown (in issues 217-218, adapting a pastiche novella by Andrew Offut) that more than ten years before Conan was of great service to the previous queen, Taramis' mother, and that he was in essence told "if you're ever in these parts again and in need of a job…"
Anyway. The story opens as Taramis is visited in the dead of night by her own long-lost twin sister, whom she had been told had died shortly after birth. The very much alive twin, Salomé by name, explains how this is untrue. She was purposely left in the desert to die, because she was born with a birthmark marking her as a witch. Baby Salomé did not die but was picked up by a sorcerer from Khitai, on his way back from a voyage of study in Stygia. He raised the girl and taught her magic, but eventually cast her out as a mere witch uninterested in the higher spheres of knowledge. (Small typo here in the comic: Khitai's capital is referred to as Paiking instead of Paikang. Small potatoes). Unfortunately, he had taught the girl about her heritage and now she's back in Khauran to usurp Taramis's throne… by first usurping her identity!!! Outside of the capital city, there is an army encamped… the mercenary forces of Constantius the falcon. Constantius first asked permission to cross Khauran on his way to Turan, which was granted him provided he remained a hostage until all his men had left the country. Then the uncouth fellow had the gall to ask for the queen's hand in marriage, an offer that was naturally turned down. But now it turns out that Salomé (posing as her twin sister) has set Constantius free, and ordered the Khaurani guards to open the gates of the city to Constantius's men! To her horror, Taramis realizes that she is now in her evil sister's power! The sadistic Salomé will stop at nothing to abuse her new position and to humiliate her sister. The next day is an eventful one, as told us in flashback by a wounded Khaurani soldier named Marcios (Valerius in the original REH story, because everybody and his brother was called Valerius or Amalric back then). Salomé (still posing as the queen) holds a public assembly, where she declares that she has decided to accept Constantius' proposal. Since her new paramour arrives with his own army, there is no need for Khauran to maintain its own guard, and she dismisses her own military. To which a certain Cimmerian captain objects, naturally! Conan gets near the queen, takes a good look at her, and declares that she's a fraud, some devil posing as Taramis! (Can't fool the senses of a barbarian). Constantius's men attack Conan as well as the Khaurani soldiers present, and a bloodbath ensues. (The Khaurani were not armed, for the most part). 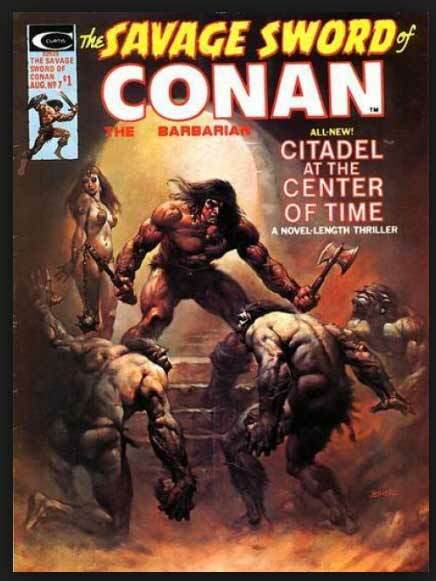 Conan is cornered and even his piling corpses thigh-deep around him doesn't prevent his being captured. Marcios, the wounded soldier who tells the story, can't believe that their beloved queen could have turned so evil. The next chapter opens as Conan has been crucified a mile from the city, a prey for hungry vultures. Constantius mocks him and departs, leaving the Cimmerian cooking under the sun. 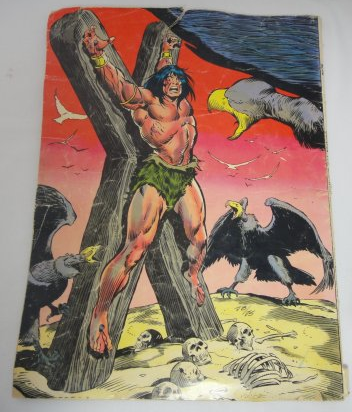 I recall first seeing Conan on a cross in CtB#57, in a scene where an old woman shows him his future… Conan on a ship, Conan as king, Conan on a cross… At the time, having no idea of what the future held, I thought the Cimmerian would really die crucified! Nooo!!! (In hindsight, since CtB#57 was published after SSoC#5, I see that it wasn't a spoiler). What a relief it was, a while later, to learn that this particular crisis happened earlier in his career. Conan endures his torment for the whole day, chasing vultures away by screaming at them, and even breaking the neck of a more daring one with his teeth. He does try to pull his hands and feet through the nails, but their heads are too broad. As night falls, curious horsemen come and see what's what. They are the Zuagirs, famous desert raiders who harass the borders of Koth, Khoraja, Khauran and Turan. Conan recognizes their leader: he is Olgerd Vladislav, who used to ride with the Kozaki. Olgerd, seeing an opportunity and apparently amused by the Cimmerian's resilience, orders him cut down (but none too gently). The big X-shaped cross is cut with axes, and (luckily!) falls down the right way, with Conan on top. Tongs are then used to remove the big nails piercing Conan's hands. The Cimmerian then grabs the tongs with his deformed and swollen paws and inists on removing the nails from his feet himself! He then climbs on a horse and hangs on without water for a ten mile ride to the Zuagir camp. "If he's fit to live in the desert, he'll live that long without a drink", says Olgerd. The take home message, here, is CONAN IS A TOUGH AND SCARY MOTHERF####R!!! A few months pass, and a Nemedian scholar writing a letter to a colleague is a good story device for some plot points exposure. The evil queen of Khauran is now an absolute tyrant who behaves shamelessly in public, murders and plunders at will, practices human sacrifice and has even (so they say) summoned a demon who now dwells in the caves of her palace. Some Khaurani knights have fled, trying to organize some form of revolutionary movement, but they need allies if they are to take on Constantius' soldiers. Such allies might be found in the Zuagirs, who have become bolder and bolder in recent months; it is said that their leader, Olgerd Vladislav, now has a second in command who has really stirred things up: a fellow named Conan. Could this be the same man who was supposedly killed months ago? The scholar has also met Marcios, who is now convinced that the erstwhile captain Conan was right: the true queen must have been replaced by some double, as it is impossible for her to have changed so much in so little time. Marcios is doing his best to prove the point, and to try and free the real queen, wherever she might be (if, that is, she is still alive). We come back to Conan, whom we last saw months and months ago. His wounds have healed, but he is now much more Nietzshean than before. Second in command to Olgerd Vladislav, he now means to become sole chief and to join the 11,000 Zuagirs to the 3,000-strong Khaurani rebels to topple Khauran's queen and take his revenge on Constantius. Olgerd is furious that Conan would have made such moves without telling him, and the two fight it out; Conan breaks Olgerd's arm by just squeezing it, and send him off to the desrt, warning him about not being seen by the men; for Zuagirs have little sympathy for deposed leaders. As the wounded Olgerd rides away, Conan taunts him: "Are you fit to live, Olgerd Vladislav"? The Zuagirs approach the city with siege engines, prompting Constantius' mercenaries right to intercept them. They charge the desrt men who then part in two groups, opening the way for a countercharge by 3000 armoured Khaurani knights! The siege engines were fake, a tempting lure that drew the mercenaries away from the protection of the city walls. As Constantius' men are crushed between the two attacking forces, Conan and a few men slip into the city and search the dungeons for the true queen Taramis, whom they find in a sorry state. But the poor queen's ordeal is not over, as Salomé and her henchmen use magic to attack the rescuers, and make off with tarmacs! Only Conan survives the onslaught, and he pursues the witch, catching up just as she's about to drag Taramis into her unholy temple to sacrifice her to whatever devil she's got in there. As Conan dispatches the witch's huge acolyte, Marcios appears and plunges his sword in Salomé's heart, from which comes not only blood but an eldritch fume. Conan, Marcios and Taramis make it out of the temple, but then a still-living Salomé follows, calling the name "Thaug" before finally collapsing. Thaug turns out to be the devil in the temple, a huge monster who then walks out the brazen doors; Conan takes a few stabs at it with his sword, until the Zuagirs ride into town and shot the thing down with arrows. Taramis is restored as queen, Marcios is made captain of the guard, and Conan decides he'd rather go on as chief of the Zuagirs. One last item of business remains, though, since Constantius has survived: the business of a much-delayed justice. - Conan is about 30 in this story; it occurs after his days as a pirate on the Vilayet andshows the start of his career as a Zuagir desert raider. - Roy explained how he made Conan a more active character in this story. In the original, Marcios/Valerius does a lot more. The change was quite justified for a comic-book adaptation, methinks, and works very well indeed. - Olgerd Vladislav will be seen a few more times, notably in SSoC #6, SSoC #31, SSoC #32 and SSoC #58. 4) Starting with issue 29, new writer Don Kraar continues the storyline begun in issue 20, but turns away from intrigue to favor high action as Conan engages in an imperial campaign. It's straightforward fun with efficient art by Mike Docherty (for most issues) or Judith Hunt. I liked it a lot as well, although I missed the intrigue and emotional conflict from the Zelenetz run. Still, I'd argue that this simply reflects a change in tone, not a change in quality; there are many great moments in that run too. Issues 29-30 have gripping moments of action, and there are very funny one-liners here and there. The Kraar storyline ends with issue 49. I read this a long time ago, but I recall Kraar basically retconning the previous arc. I could remember it wrongly, of course, because his run, as well as the independent stories between Thomas and Zelenet, were quite forgettable. Re-orienting is the way I'd call it rather than outright retconning, since Kraar didn't actually undo things that had happened before, but you're right: there was indeed a drastic (and at the time unwelcome) change in tone and in direction. It was however done in a plausible way: the Black Dragons subplot was dropped by having them all massacred by the Picts, the queen simply stopped seeing her would-be paramour, all the political intrigue was dropped by the sudden occurrence of a world war, and the "son of Conan becoming a wizard" plot was dropped when it was revealed that he had been a magical imp all along. (Only to replace him by Conan's real son, who... had been raised as a wizard. Strange plotting decision, here). In hindsight the Kraar issues do read like one long and almost uninterrupted battle, but they had their moment (I thought). Ok, now it's coming back. It was Owsley who retconned Kraar, in order to finish Zelenet's plot. Thank you, James (or Christopher). Exactly! And for once, that was a retcon I didn't mind because the Owsley/Zelenetz plot was pretty darn good! My only small gripe is that those final issues did invalidate some of Kraar's run. But I suspect that part of the problem is that Conan the King was being cancelled, and that a lot of story had to be resolved in very few pages. Kingdoms and caravans, by Robert L. Yaple. Another essay giving this book a maturity, a scholarly value, that is not usually associated with fantasy series of comic-books! Here we review what the Conan books say about trade and trade routes. The Kline Conan, a series of pinups by an artist I am not familiar with. These scenes all come from REH stories. Digging a little, I came across a Bob Kline who, like the artist featured in SSoC#5, worked on the Star Trek animated show. I suppose they're the same fellow. *edit* : his signature is verity similar to that seen in the Conan portfolio. And that's pretty much it for this issue! I somehow remembered this issue as a minor one… but upon re-reading it, I can't understand why. 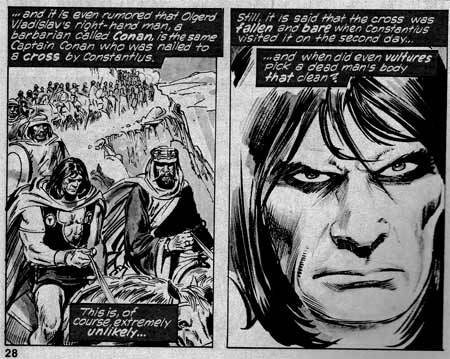 Not only does it present two Conan stories of significant importance, but it also has two very good text pieces. It is also something of an Alex Niño-fest: not only is one of the stories drawn by the stupendous Filipino artist, but we're also treated to a cool-looking pin-up and to a cover! (Well, all right, I suspect that Niño provided the initial art for the cover which was then painted by co-artist Frank Magsino. Both gentlemen signed the work).The cover depicts an actual scene from the second story presented in the issue. 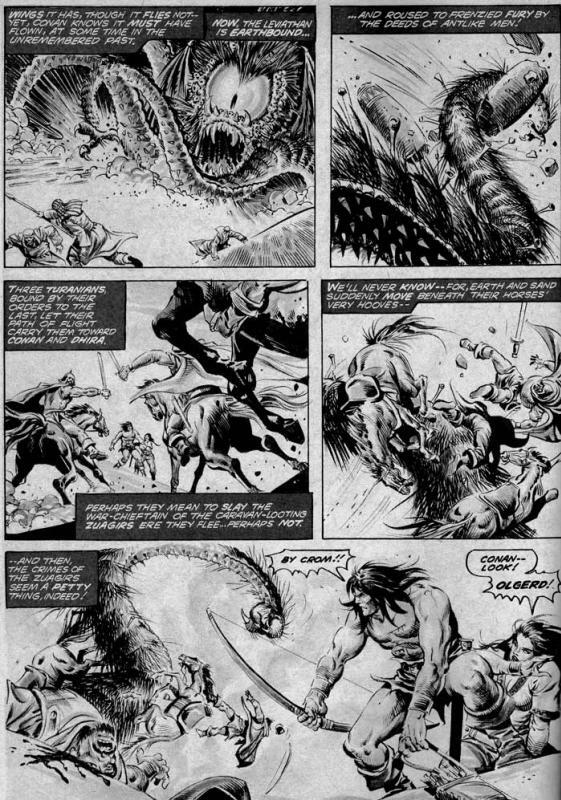 The sleeper beneath the sands, an original Conan story by Roy Thomas drawn by Sonny Trinidad. The gods of the Hyborian age, the first of a series of article by Robert Yaple on the subject of ancient gods and religions. Had this been required readings for future writers of Conan, maybe we'd have been spared Turanians swearing by Ymir and Nemedians swearing by Erlik. 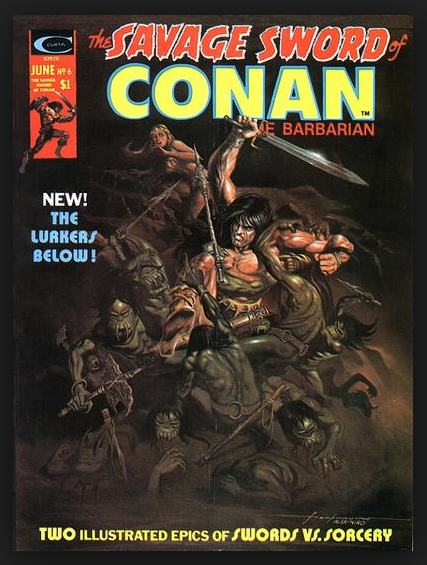 It is awesome to see that this article is fully referenced (using the Conan paperbacks as its source). Can any good thing come out of Cimmeria? the continuing essay in which Lin Carter covers the origin of the S&S genre, here telling us about the literary origin of Conan. People of the dark, a REH adaptation by Roy Thomas and super star Alex Niño. 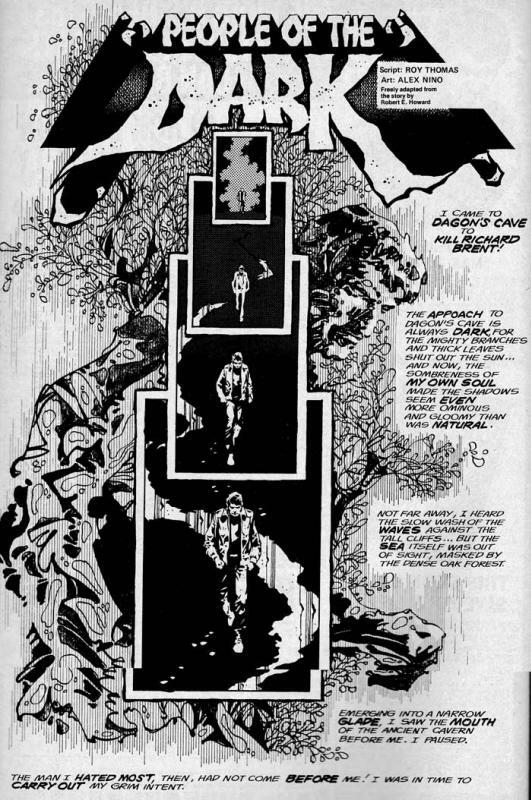 People of the dark and the Alex Niño pinup accompanying the Lin Carter piece were reprinted (in colour!) in Marvel Treasury Edition # 19 and #23, respectively. This issue starts a tradition that was welcome at the time and that agrees with future editor in chief Jim Shooter's philosophy that "every issue is someone's first issue": the presentation of a map of Conan's world, as adapted from Robert Howard's own map. Each issue, this map would come with a short blurb describing how the first story fit in the chronology of Conan's career. (Under Thomas, this would actually make sense and make references to actual Conan stories; later on, in the 80s, it would just often be made up on the spot and refer to sweet f%&k all). The sleeper beneath the sand, story by Roy Thomas, art by Sonny Trinidad. This is a direct sequel to the previous issue "A witch shall be born". Conan has been chief of the desert-dwelling Zuagirs for just a few weeks. He is roughly 30 at the time. The tale has strong Lovecraftian overtones that obliquely refer to the C'thulhu mythos, but it was a common thing among the Weird Tales stars (Lovecraft, Howard, Smith) to cross-reference their tales, and Howard had quite a few stories about "ancient ones sleeping until some day they wake up to doom us all". It's a pretty good yarn, with strong character clashes, action and a pretty spooky supernatural element. 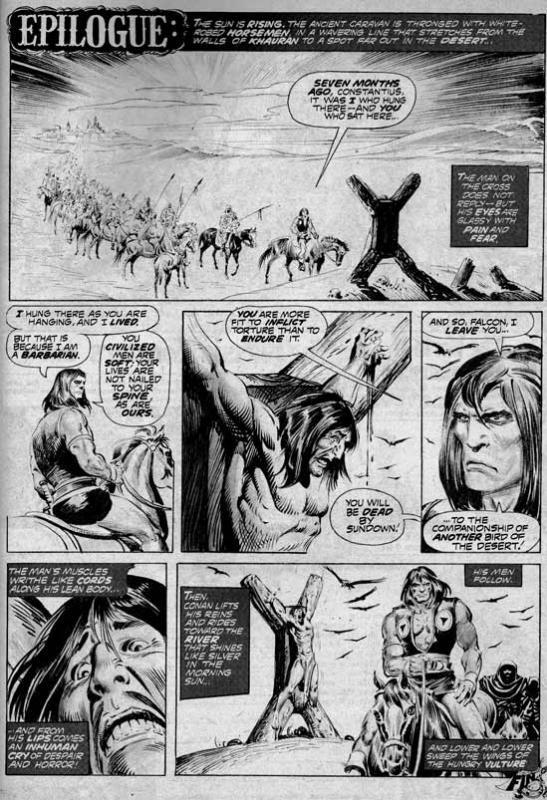 Sonny Trinidad is an artist I mostly knew through his work on Son of Satan; here he provides solid and dynamic artwork in the Buscema tradition. We start with Olgerd Vladislav, the deposed leader of the Zuagirs, who's now lost in the desert after his ouster by Conan. His right arm is broken and twisted, and he's on the verge of death. Lucky for him, he's rescued by a group of pilgrims on their way to a desert temple; they are led by kindly Ahmed Mullah and his daughter, the firebrand Dhira. These pilgrims, paradoxically enough, are bound for the spot where dwells "the sleeper beneath the sands", an antediluvian demon; as they must every 50 years, they are about to engage in a ritual that will cause the creature to keep sleeping. 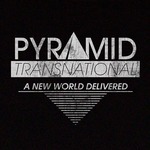 Unlike the usual cults in this kind of stories, these ones actually are there to defend the rest of the world and not try to rule it through the reappearance of a supernatural creature. Posing as a lost Zuagir, Olgerd learns from Ahmed that the Zuagir chief, Conan, is rumoured to also be heading to the temple in order to meet with his lieutenant Jebal. (This convenient coincidence is explained in a pretty elegant way: there aren't that many recognizable meeting spots in a desert)! Olgerd plots his revenge against his erstwhile comrade turned enemy. At the temple, everybody prepares for the ritual. If the sleeper were to awaken, the only way to send him back to sleep would be for someone to speak certain words of power and agree to go back with the creature to its hellish world. But Olgerd cares nothing for the fate of the world: as soon as Jebal shows up, he kills him, then kills Ahmed, then takes Dhira hostage to force the rest of the group to aid him in capturing Conan. The Cimmerian shows up, is captured, and is tied between two columns in the temple (like Samson in the Bible, a reference to which is made. That's two biblical references in two issues, what with the John the Baptist one from issue #5)! Olgerd is caught by one of the Sleeper's tentacles, and screams for help. Conan grabs a bow and is tempted to put the Zaporoskan out of his misery, then reflects that Olgerd never did anything for him… and leaves him to the Sleeper's tender care. Deciding that now would be a good time to get the hell away, Conan turns to Dhira… to find her gone! She went back to the ruins of the temple, and is busy reading the "words of power" from a scroll to send back the monster to its underground dwelling! The brave girl succeeds, but is carried back to the netherworld with the Sleeper. Conan muses that in fifty years, when the Sleeper starts waking again, there won't be anyone left to soothe it back to sleep… and he intends to be leagues away when that happens. - Jebal was mentioned in A witch shall be born, SSoC#5. - Olgerd Vladislav was supposed to be dead at the end of this story, because Marvel didn't have the right to adapt the L. Sprague de Camp/Lin carter Conanization of a REH story (Country of the knife = the flame knife) in which the two men had used Olgerd again. 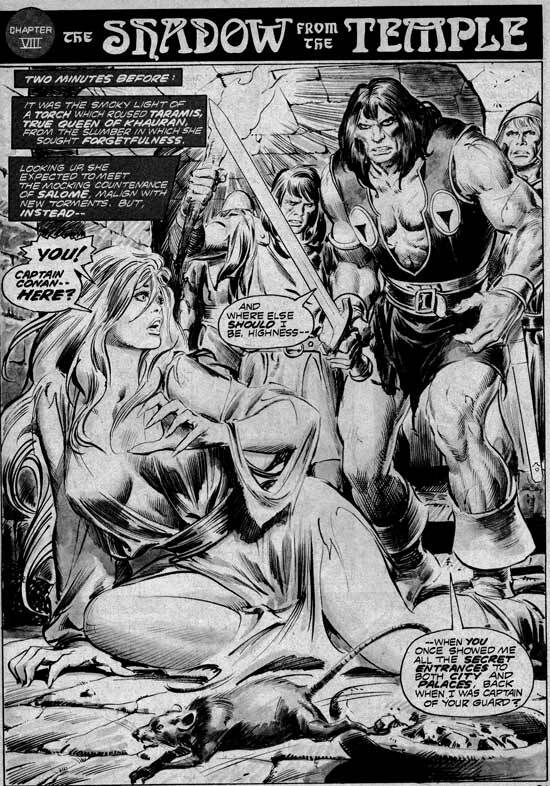 When those rights were obtained and the story adapted in SSoC 31-32, the man's return from death (and his recovering a functional right hand) had to be explained, something which was done in a rare Hyborian age tale featuring neither Conan nor Red Sonja, in SSoC#58. - This might have been a minor story, serving to tie up some loose ends from a witch shall be born, but it's actually quite powerful. The girl Dhira turns out to be quite a heroine! Gods of the Hyborian age, by Robert L. Yaple. A scholarly article on many (perhaps all?) of the gods seen in the Conan stories. Here we place them geographically and culturally. 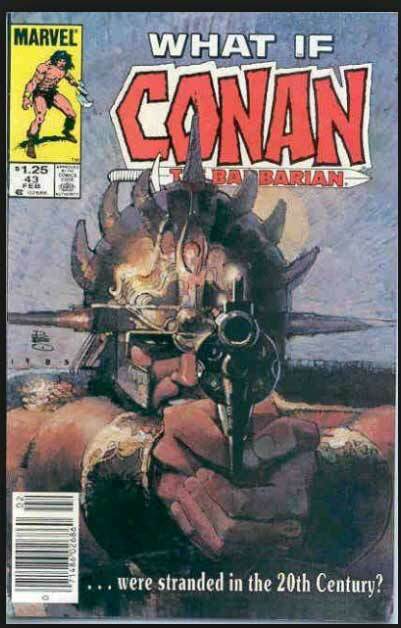 Conan may have sworn by many gods besides his own, but the many pantheons of the Hyborian world were definitely not universal. Very interesting reading indeed. Can any good thing come out of Cimmeria? by Lin Carter. 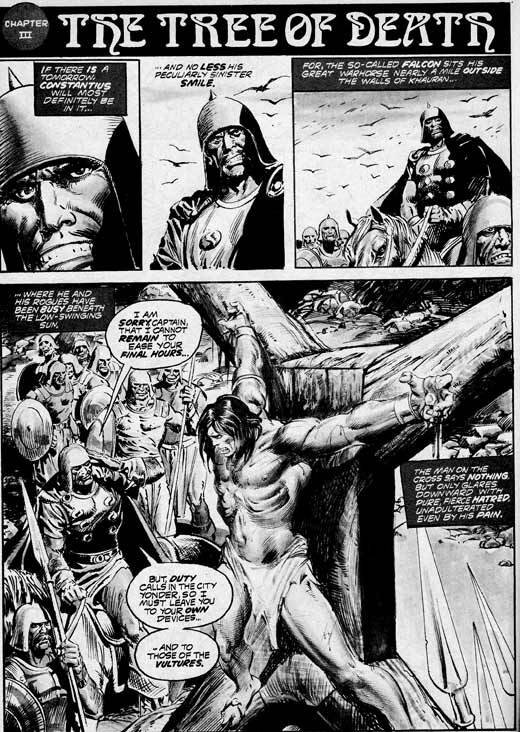 The origin of Conan, as a character, from a rewrite of an unsold Kull story. It's stuff that we probably all know by now, but back then it must have been precious information for fans! People of the dark: script by Roy Thomas, art by Alex Niño. This is a unique adaptation: it is the Conanization of a non-Conan REH story... BUT! But the original story's hero is named… Conan! People of the dark was first published in the June, 1932 issue of Weird Tales. It is a reincarnation story, in which a modern man (after hitting his head) relives a few moments of a past life; a past life in which he was a Gael reaver named Conan. The first "real" Conan story, "the phoenix on the sword", would only see print in Weird Tales in December 1932. The story would have been very suitable to a Conanization treatment even if the heroes'names weren't the same: Roy places it right at the end of the sack of Venarium, when Conan hasn't yet seen 15 winters. (He looks much older than that in this adaptation, but let's let it pass). The sack of Venarium is a very important moment in Conan's life. It is apparently the first time he joined other warriors in any kind of big-time operation. In this case, many Cimmerian clans (usually feuding between themselves) agreed to join forces to attack a fort and trading post built by Aquilonians and Bossonians in southern Cimmeria. The wild hillmen just threw themselves at the fortifications, climbed the walls, and their fury overwhelmed the civilized men's better equipment. The sack of Venarium would put a halt to the northern expansion of the mighty Aquilonian kingdom. The battle itself had been alluded to in REH's stories, but never actually depicted. 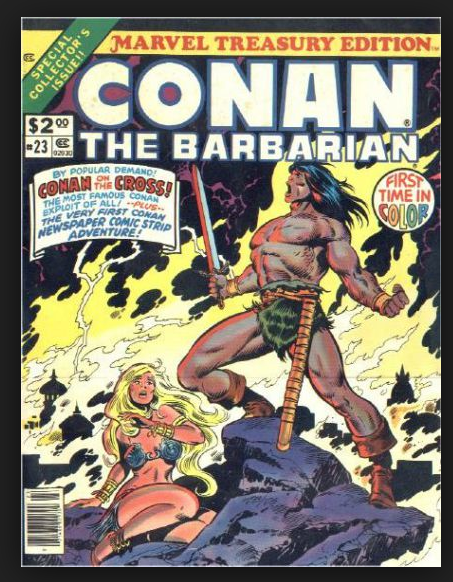 It remained a sort of sacred event for decades, out of bounds, not to be adapted, until it finally was in the grotesque Conan the barbarian #235. (That infamous issue shows how Venarium was destroyed by the magical superpowers of Conan's childhood friend). 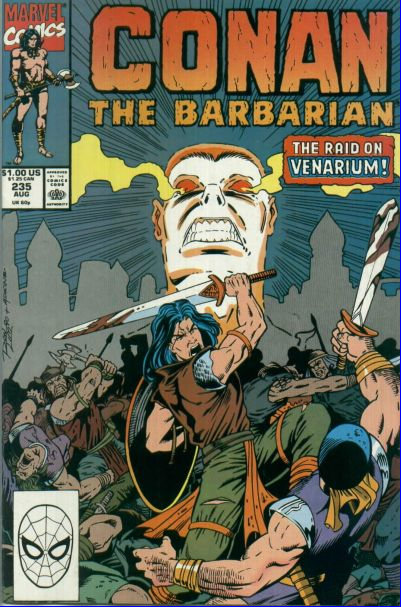 So bad was it that when the Marvel series was rebooted as Conan the adventurer, the very first issue described the battle of Venarium again, but in a way that, this time, agreed with what we knew of the event. I suppose I don't have to emphasize the fact that the art looks gorgeous. It is nothing like what we'd seen before in this title, but is all the more welcome for it, emphasizing the variety of material found in SSoC. We start with Jim O'Brien, a modern man whose passion for one Eleanor Rand gives him murderous urges: O'Brien intends to kill his rival, Englishman Richard Brent. O'Brien has overheard that Brent intends to go explore the ages-old, deep and spooky Dagon cave; his dark passion prompts him to get there first and get rid of Dent (believing that with Dent gone, Eleanor would turn to him). As he gets deeper in the cave, O'Brien reflects on the ancient legends surrounding it; the place is associated with the little people, supposed to be the historical forerunners of trolls, elves, fairies and goblins; these little people would have been an indigenous mongoloid race pushed back by the invading Celts. They'd have found refuge underground, first in caverns, and then in tunnels, where they'd have devolved into a reptilian-looking, thoroughly revolting branch of humanity. The REH story "the children of the night" (Weird tales, Apr-May 1931) had also featured the Little People; they were the same as the worms of the earth from the most famous of the Bran Mak Morn stories (Weird Tales, Nov 1932). In the dark, O'Brien slips and falls; he bangs his head and loses consciousness. As he wakes up, he is Jim O'Brien no longer, but Conan the Cimmerian. 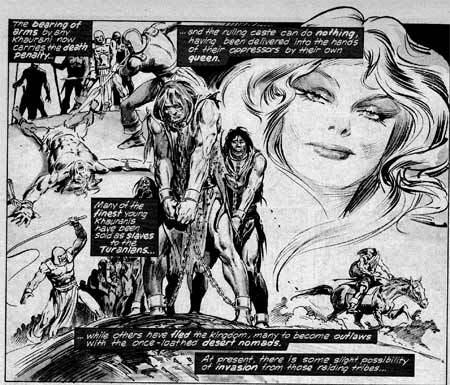 A young Conan, one who just took part in the battle of Venarium, depicted here as a gorgeous double-page spread. 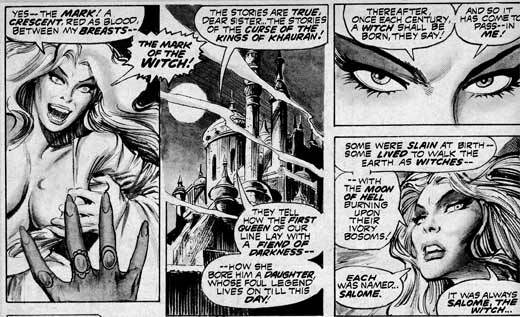 (Unfortunately, this double-page spread would be split between an odd- and an even-numbered page in Marvel Treasury Edition #19). We learn that Conan stayed behind after the fight, hoping to find an Aquilonian girl he had earlier taken a fancy to; the girl, Tamera, is indeed still alive… but accompanied by her lover, the Gunderman Gaeric (Vertorix in the REH original). Now this scene is interesting, coming right after our recent discussion on Conan's behaviour in "the frost giant's daughter". Conan is once again chasing an unwilling girl; one who already has a lover, to boot! And unlike what happened with Atali, here he can't pretend he's been goaded into behaving dishonorably: he's just a hormone-laden teenager chasing a girl running away from him. Luckily for him, events will make it so that he doesn't look so bad later on. Gaeric comes to, manages to rejoin Tamera, and the two of them get into Dagon's cave (it's a very old cavern). Conan pursues, and all of them are then attacked by the people of the dark, the little people, looking all scaly and squamous. It's fighting them in the dark that Conan bangs his head, and that's when Jim O'Brien starts remembering the events. The two southerners are gone, and Conan tracks them in the dark; he finally reaches a vast underground temple where he finds them, tied to an altar. Conan has to fight several of the people of the dark to reach the two Aquilonians, and he frees them so that they can at least die like people, not like animals. Gaeric and Conan agree to set aside their feud until they are free. Much fighting and running follow, and when they finally see the day's light coming from far ahead, Conan tells Gaeric to take the girl to safety (phew! At last a honorable move!) while he stands his ground to stop the diminutive hordes of reptilian folks. But Gaeric refuses! So they stay there, agreeing that Gaeric should slay Tamera before they fall, so she won't be caught by the Little People to suffer who knows what grisly fate. In the following mayhem, they are separated. Conan goes through several tunnels and finally reaches an exit, a small ledge on the side of a heavy waterfall. He can see Gaeric and Tamera on a similar ledge, on the other side of the waterfall; but they are under assault by their pursuers! Conan manages to strike one of the people of the dark with a thrown stone, but Tamera slips on the wet rock and falls to her death. Gaeric screams her name, throws his axe in the face of the nearest creature, and jumps after her. And then Jim O'Brien wakes up. Following tunnels now a little more familiar, he reaches the same spot where Conan, millenia earlier, had seen the end of Gaeric and Tamera; and there he spies Eleanor and Richard. The girl is explaining how this place seems to bring back strange dreams, dreams in which she was running through endless corridors. She says Jim was there, and so was Richard, but none of them were who they are today; she also declares her love for Dent. Just then, a monster appears: a hideous reptilian thing, snakelike, that the hidden John O'Brien recognizes as the improbable descendent of the People of the dark. He jumps out of his hiding spot, shouting for Eleanor and Dent to run away, and shoots at the creature. The monster dies, but as it falls it crushes O'Brien who dies knowing a debt has been paid. A powerful tale, and a powerful adaptation! - The People of the dark are here shown to have existed long before the Celts existed, and so their inclusion in a Conan tale requires some extra explanation. Someone else must have pushed them to live underground. A problem I see is that their form seems to have changed dramatically between the time of Bran Mak Morn and today (something like 1600 years, then) while they remained relatively un changed between the era of Conan and that of Bran (a period of roughly 10 000 years). Another Boris Vallejo cover, in full Frazetta mode. I am surprised that this particular image was not reused more often; it is really stunning. (Other SSoC were often used again and again for paperback books and whatnot). - The Hyborian Age (part I), an illustrated adaptation of the essay by REH. Script by Roy Thomas, art by John Buscema and Alfredo Alcala. This is an original story from Roy's typewriter, but it is so good that Howard himself could have written it. It tells of the encounter between the Cimmerian and one Shamash Shum Ukin, who was king of Babylon around 650 BC. 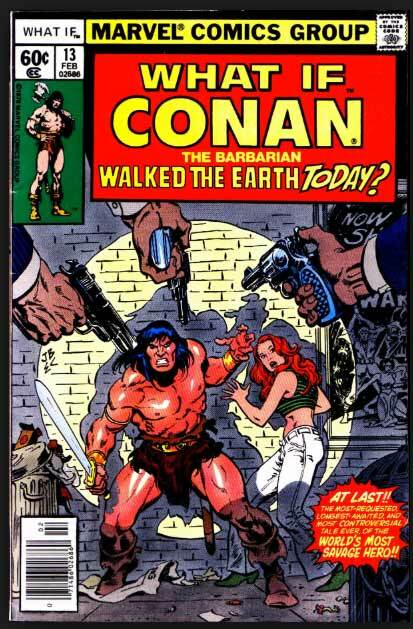 Conan is still chief of the Zuagirs, as he was in issues 5 and 6; he is 30-31 around that time. The tale starts with the Zuagir raiders attacking a caravan in the desert; said caravan comes from the Shemite city of Akbitana (often mentioned in regard of its steel products). This time it carries something unusual: a strange animal bound for some rich lord's zoo in the north. Unfortunately, during the attack, the animal escapes. It is something never seen: a saber-toothed tiger. Conan and his zuagirs dispatch the beats with lance and arrow, saving a veiled woman in the process. (It is not clear whether she's in charge of the caravan or not, but she certainly seems to be among its higher-ups). With little profit to show for the day's efforts, the Zuagirs return to camp and Conan entertains the lady. She tells him of the beast's origin. A few months prior, during the night, a great ziggurat suddenly appeared in Akbitana. It is said to be inhabited by a powerful wizard, who remains ever unseen; only a manservant sometimes comes out to exchange strange and exotic things for food and the like. Sometimes he brings jewels, sometimes strange tools, sometime exotic animals (like the tiger). It is also said that people disappear from time to time from the streets of Akbitana, and it is suspected that the wizard must be involved… but no one dares do anything about it. Conan is intrigued, and decides to go investigate… after all, as chief, he must find something for his Zuagirs to plunder. Before he goes, though, the lady has a request no full-blooded Cimemrian would refuse to grant; she also says that she wants to keep her veil so that if she ever marries some fat merchant and meets Conan again, she won't have to blush. Excellent writing, here! In Akbitana (a city whose name probbaly comes from historical Ecbatane, which is more or less located in the same region according to the excellent map by Trent Thompson) Conan finds a talkative butcher who explains that the great crossbow in the center of town was another gift from the wizard. 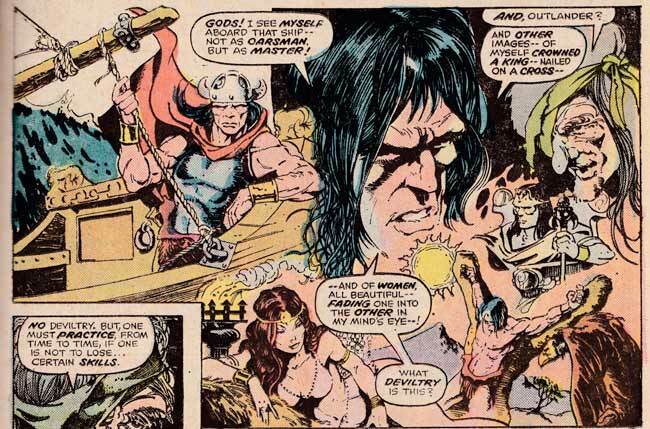 (He also comically mentions that business is hard with that devil Conan roaming the desert, and may Ishtar grant him to have Conan one day come within reach of his cleaver! "May Ishtar grant", agrees the Cimmerian. Shamash then explains his secret. He owns a certain well whose waters are a doorway to other times. He found that by lowering offerings down the well, he is paid back by receiving objects or animals (or men!) from other eras. Something of a hunter for knowledge, he thus explores the history of our planet. He, himself, was indeed once the king of Babylon (a city Conan knows not, as it won't exist for a few thousand years yet); it is upon the conquest of the city by his brother Asshurbanipal that Shamash used his magic to send his ziggurat back in time. Naturally, Conan is meant to be an offering to the well, which he doesn't take to enthusiastically. Breaking his bonds, he tries to escape but is set upon by a horde of Neanderthals under Shamash's orders. Recaptured, he is bound again and about to be lowered in the well… alongside with Alhambra, who has begun to bore Shamash! 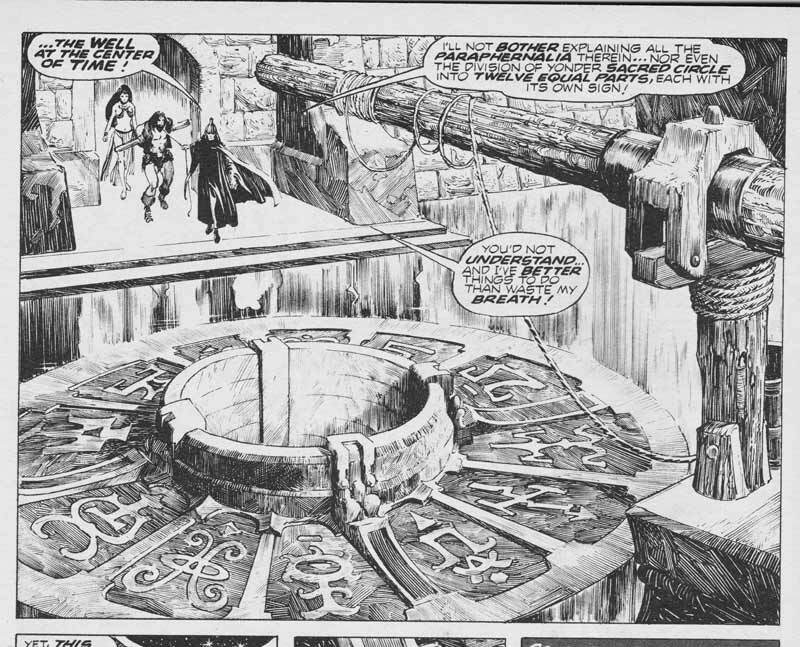 This descent into a time-piercing tunnel was the basis of What if #13, in which Conan is indeed lowered all the way down and ends up in the XXth century. At the end of that particular story, Conan had been struck by lightning while on top on an inverted ziggurat (New York's museum of modern art) and been sent back to the Hyborian Age. In a variation of that story, in What If #43, Conan had remained stuck in today's world and become a street gang leader. As Conan and Alhambra are lowered into the well, they catch glimpses of other times: cataclysms, mammoths, Egypt, dinosaurs, even Shamash himself as he escapes his brother during the fall of Babylon. The time vapors coming from the depths (or whatever they are) then start weakening the Cimmerian's bonds, who breaks them and climbs out of the well with the girl under an arm (quite a feat, if you ask me). Coming out of the well, they face the the guys whoi earlier wanted to hire Conan as an assassin: the ruffians have decided to do the deed themselves. Everybody fights, and assorted threats like a cave bear, more Neanderthals and a pterosaur make short work of the intruders. Shamash, quite aware that Conan is no longer in his power, simply agrees to let him go. But then the ziggurat starts trembling! It doesn't seem to be a natural earthquake, so I'd assume that it was some after-effect of using the well too much… but in any case, walls start tumbling down and the T-rex escapes! The beast (which to everyone is "a dragon") rampages in town but is eventually slain when Conan forces some city guards to use the giant crossbow against it. Shamash, meanwhile, jumps into his well, not knowing what will happen to him, but reflecting that he had anyway grown lazy and was ready for new discoveries. (He will return in SSoC 65). We end as the butcher wonders if there might be a market for dragon steaks. Overall a very enjoyable yarn, and the introduction of actual historical characters was done with finesse. - As stated earlier, Conan is 30-31. - Shem is a pastoral land stretching south of the Hyborian kingdoms; it has meadows in the west and deserts in the east. It is located north of Stygia. - We witness several ways in which Conan interacts with women: rough gallantry with the veiled lady from the caravan, polite but reserved flirting with a tavern waitress he does not particularly fancies, and a combination of "gotta save this treacherous wench from danger but I'll turn her over for punishment once we're out of this mess" with Alhambra. More on the genesis of Conan. This is an early essay, and Carter falls prey to the old misconceptions about Howard and his suicide. It is illustrated by a Gray Morrow drawing; Morrow had earlier done an adaptation of "the tower of the elephant", now lost. 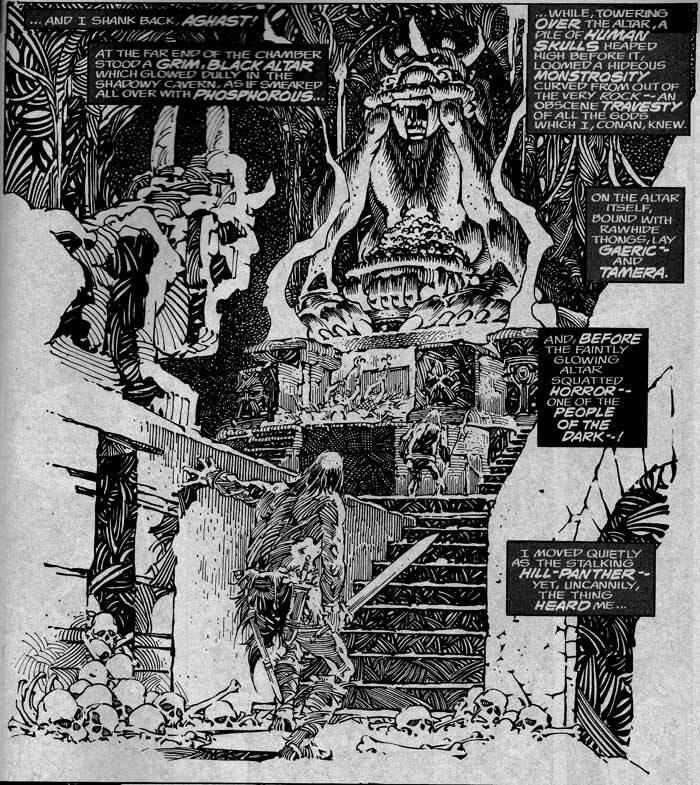 A poem by REH, illustrated by what seem to be preliminary studies of Conan of Kull by a very young Barry Smith. 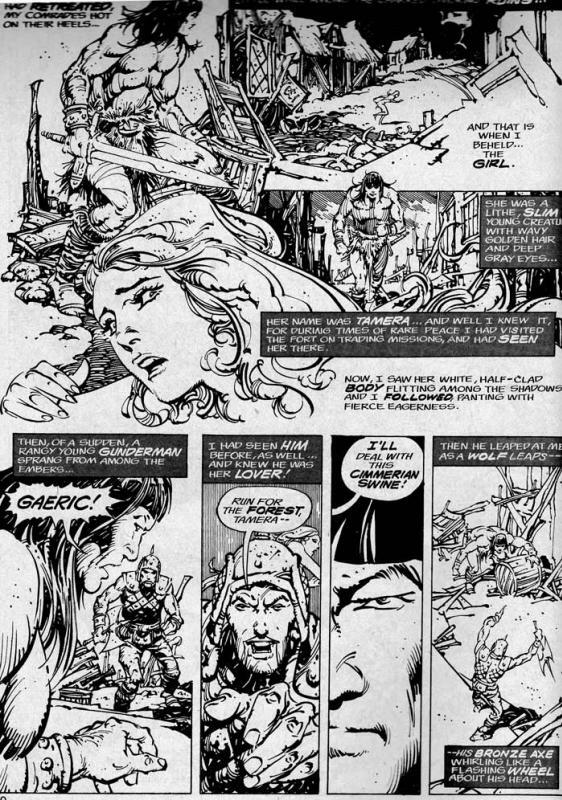 Script by Roy Thomas, art by Walt Simonson, adapted from the essay by Robert E. Howard. This is an overview of the invented history that serves as a background for the adventures of Kull, Conan and Bran Mak Morn. This first version is magnificent, and would fully deserve to be reprinted in color. It has been redone twice in a shorter form; once drawn by the able Ernie Chan (in CtB 87) and another (forgettable!) 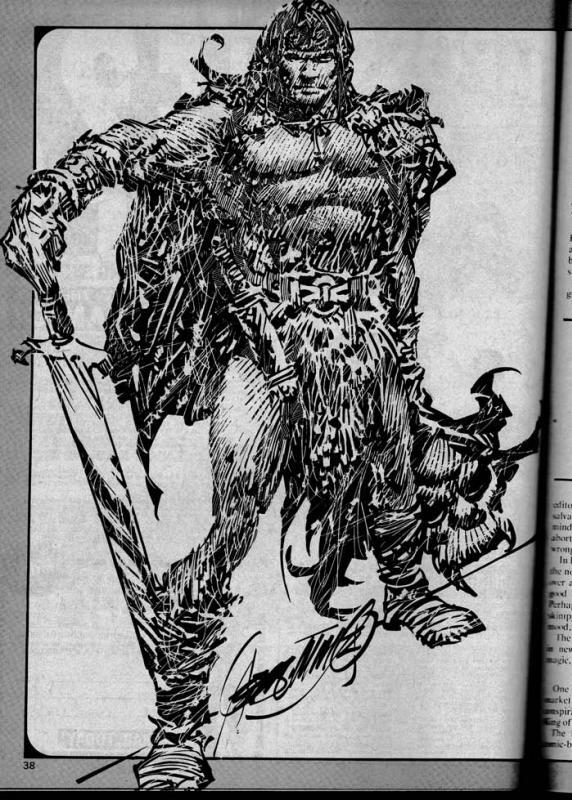 time in the Conan the adventurer comic-book. Walt always knew how to draw myth and legend; every panel makes you want to immerse yourself in that fantastic world he is depicting! What an artist, what an artist. In this first instalment, we cover the period of the Thurian kingdoms, up to the cataclysm that saw Atlantis fall below the waves.